A recently released English-language booklet that both describes life in Yemen as an Al Qaeda in the Arabian Peninsula (AQAP) fighter and encourages westerners to carry out attacks inside their home countries is the latest in a series of AQAP publications demonstrating its commitment to reaching western audiences with its violent message. The phrase “individual decision-making attacks” is an apparent reference to the “Lone Wolf” phenomenon, where individuals self-radicalize, often online, without any face-to-face interactions with established terrorist groups. Despite advocating for individuals to carry out attacks in the West, the booklet is mostly devoted to giving “fellow Muslims a sense of the live [sic] of a mujahid,” including issues such as cleanliness, living on base, secrecy, injuries, training and family life. 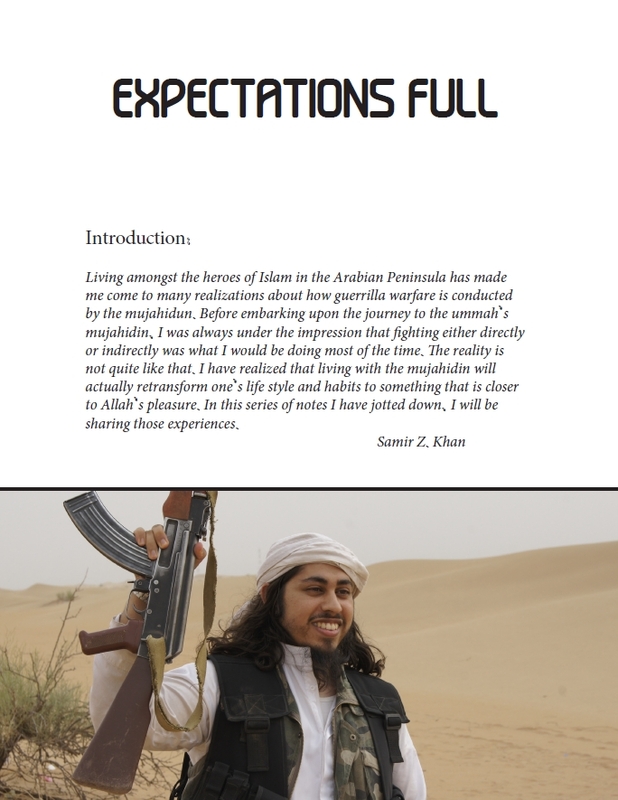 Although AQAP claims that Khan is the author of “Expectations Full,” the document itself bears no indications or hallmarks of his writing. In fact, in one of the sections the author discusses living on bases without access to any electronics, which would be ironic for someone who is best known for creating online propaganda. AQAP may be trying to leverage Khan’s reputation as an American who made “it to the front lines of jihad” in an effort to reach out to Western audiences and spread its call to fight, preferably while staying at home. The release of the publication closely follows the release of two new issues of the terrorist magazine Inspire and a tribute to Osama bin Laden, also in English, earlier this month. The rapid succession of English-language propaganda comes after a lull of several months and is an indication of renewed attempts by AQAP to reach and recruit a Western audience.